David Jaffe, the creative force behind the Twisted Metal franchise, has released an HD version of the game’s tentative cover art. The artwork originally appeared on GameStop’s website earlier in the week. He also posted five different variants of the game’s back cover art. Sweet Tooth, the series longtime poster clown, adorns the front of the game’s case, which is “about 95% locked“, but may get an added helicopter. 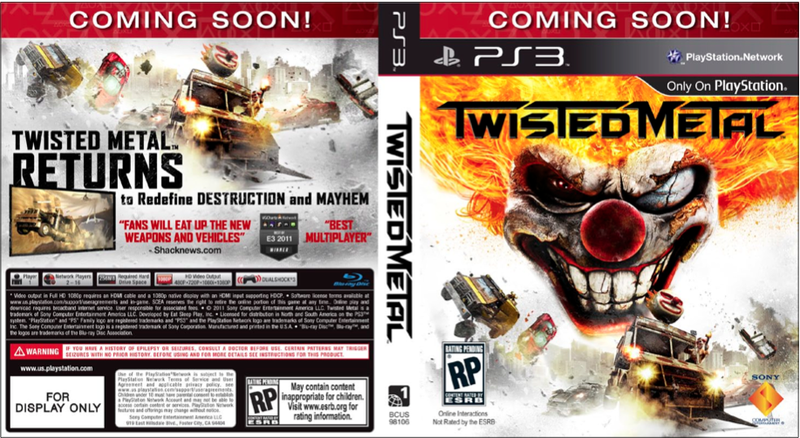 The 2012 version of Twisted Metal was unveiled at E3 2010 after 2 years of teases and denials. The game is set to feature 16 player online multiplayer in addition to the single player & local multiplayer components the series is known for. Aside from Sweet Tooth, Twisted Metal is set to introduce a whole new roster of playable characters. Let us know which covers you want on the final box art ahead of its February 14th release in the comments below.